Home » Blogs » Charles Gaba's blog » Kentucky: Will Mitch McConnell seriously propose a $700 Million tax increase on Kentuckians tonight?? UPDATE: He did it!! Kentucky: Will Mitch McConnell seriously propose a $700 Million tax increase on Kentuckians tonight?? UPDATE: He did it!! What arglebargle will come out of Mitch McConnell's mouth regarding trying to yank healthcare away from over half a million Kentuckians this evening? The Big Senate Debate of the day promises to be the showdown in Kentucky between Republican Senate Minority Leader Mitch McConnell and Democratic Challenger (and current Secretary of State) Alison Lundergan Grimes. According to NBC News, there's a chance, at least, that McConnell may finally have to provide a straight answer as to what he intends to do to provide health insurance to the 527,000 Kentuckians (and counting) who are currently enrolled in either private policies or Medicaid via the Kynect healthcare exchange. Otherwise known as the Affordable Care Act healthcare exchange. Otherwise known as the Obamacare healthcare exchange. For his part, McConnell is likely to face questions about health care. The senator has said he favors repealing Obamacare. But he has been repeatedly pressed on the impact that would have on Kentucky, which had a very successful rollout of the program, with more than 400,000 people now enrolled. Data released earlier this year from Gallup showed that Kentucky ranked second in reducing its uninsured population since Obamacare’s inception, behind only Arkansas. 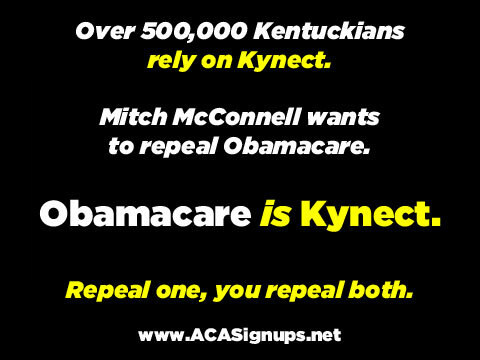 McConnell has suggested the Bluegrass State can keep in place “kynect,” the name Kentucky has given its health care exchange, even if Obamacare is repealed. This is technically true, but also very misleading. If Obamacare were repealed, the federal funds to expand Medicaid and offer subsidized health insurance for people through the exchanges would be gone. It’s unlikely Kentuckians would enroll through a health insurance program called “kynect” without the huge discounts in price that come from it being a part of the national health care law. 1. As noted above, the total number of Kentucky residents who are enrolled in an ACA-provided policy (private or public) now tops 527,000, not 400,000...and that was a month ago. My guess is the Medicaid side has pushed the total up to around 550K by now. Oh, yeah: It would impose an additional $700 MILLION TAX (or higher) on the residents of Kentucky. Now, I know that Kentucky residents hate President Obama. I know that Ms. Grimes is very reluctant to mention the "O" word under any circumstances. The fact remains, however, that repealing "Obamacare" means repealing Kynect, and more importantly means taking away the funds for Medicaid expansion & private policy tax credits for over half a million Kentuckians. Somehow I doubt that a Republican Senator from Kentucky is going to be too keen on adding $160 in new taxes each year to every man, woman and child in his state, but it'll be fun to find out. UPDATE: Well I'll be damned. He did indeed propose a $700 Million annual tax increase per year for Kentuckians!! Moderator: And you would support the continuation of kynect? Moderator: But would you support it? McConnell: Well yeah, that’s fine (chuckle) I think it’s fine to have a website.